A sharp-eyed camera on NASA's Mars Reconnaissance Orbiter has located the impact scars left by components jettisoned from the Curiosity rover on its hellish descent to the Martian surface in August. The rover was encapsulated inside an aerodynamic heat shield and supported by a cruise stage during its eight-month flight from Earth to Mars. Shortly before the craft plunged into the Martian atmosphere on Aug. 6, it jettisoned the aluminum donut-shaped cruise module, which provided electricity and propulsion on the interplanetary journey. Moments later, the rover's entry vehicle released two 165-pound tungsten masses to shift the craft's center-of-mass for guidance during the first phase of descent into the atmosphere. The cruise stage was not designed to survive the heat generated by friction during the high-speed fall into the Martian atmosphere. Engineers expected the dense tungsten weights to remain intact during their descent. 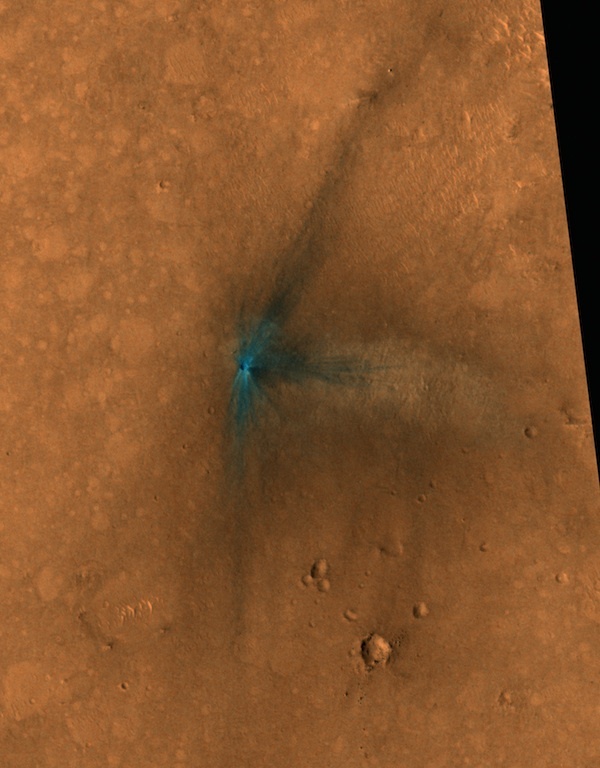 The MRO spacecraft, flying several hundred miles above Mars, spotted four large fresh impact markings about 50 miles west of Curiosity's landing site. MRO's HiRISE telescopic camera acquired imagery of the impact sites. Scientists believe two sites near each other are from the violent impact of the tungsten blocks. Two other scars may have been created by large chunks of debris from the cruise stage. 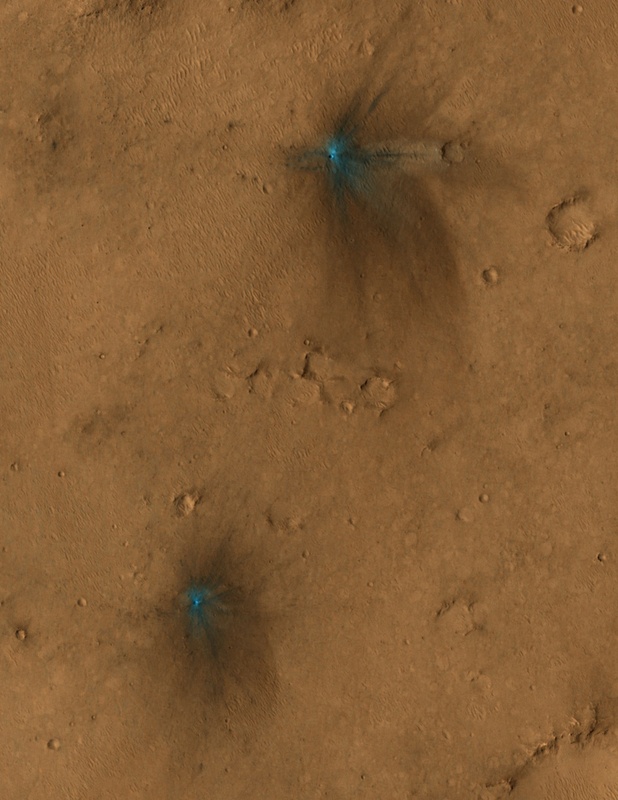 HiRISE imagery shows three of the the largest craters in color. Each HiRISE scan includes a band of color imagery at the center. The most prominent sites have craters ranging from 10 to 16 feet across. 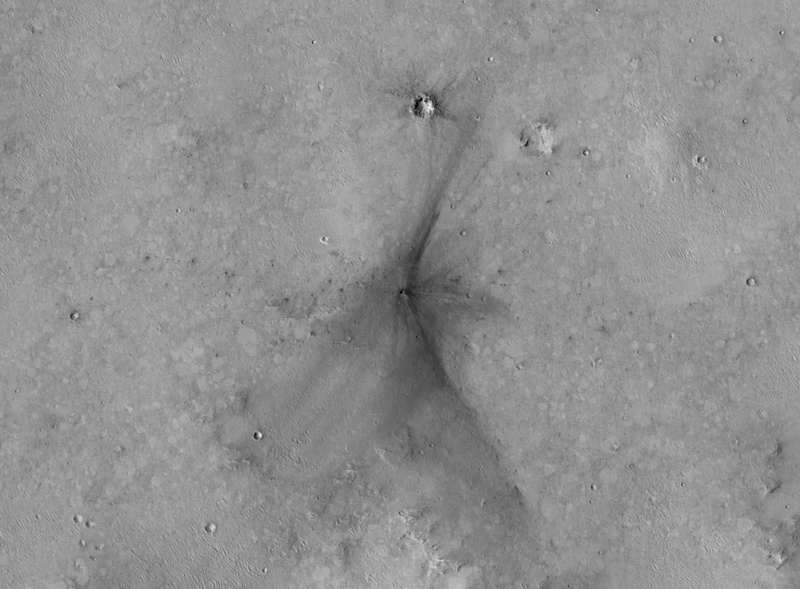 Other imagery from HiRISE shows a nearby field of impact features, which may be from smaller fragments of the cruise stage.